Flower Ornament Depository 華嚴藏: Is Astrology Religion? Yesterday I did a talk here at Leiden University discussing the presence of astrology within various major religions of the world, pointing out that the general integrity of astrological doctrines and concepts was well-preserved from medieval Spain to Japan. I also discussed the fact that astral magic, which itself is also traced back to the Greco-Egyptian tradition, accompanied the translation of astrology to Europe and East Asia. During the question session after the talk, someone suggested that astrology has been generally regarded as a science. I suggested that – perhaps contrary to the conventions of scholars in modern Religious Studies – astrology ought to be considered a religion, or more specifically a kind of “sub-religion” within larger religions. 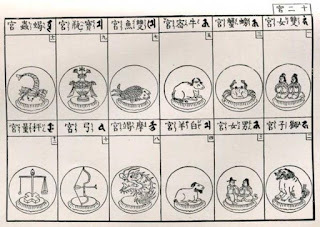 A survey of astrology in world religions will quickly reveal that Japanese Buddhists and Spanish Christians alike were simultaneously practicing astrology in the thirteenth century. Obviously, Catholicism and Buddhism are entirely separate religions, yet many of their adherents have practiced horoscopy and tried to make sense of the premises of astrology within the contexts of their respective religious frameworks. The basic theory of karma suggests that an individual’s circumstances and the quality of their experiences in life are determined by past actions, be they of the present or past lives. The circumstances of the present life can also be altered for the best through the cultivation of positive karma, i.e., benevolent conduct and acts of goodwill to sentient beings. Astrology, however, suggests that the movements of the planets signal predetermined events and experiences within the life of an individual, which can be foreknown through a skilled analysis of their natal horoscope. This is common knowledge, of course, to anyone who has read about astrology, but one fact about medieval traditions that is often overlooked is that there was often a simultaneous belief that the planets are actually gods. Saturn 土星. 10th or 11th cent. Song China. As we will recall, the planets, as we know them in English, are named after Roman deities: Jupiter and so forth. This custom of naming planets after deities is traced back to Mesopotamia, and as Mesopotamian astronomy spread throughout Eurasia and North Africa, other cultures emulated this custom. 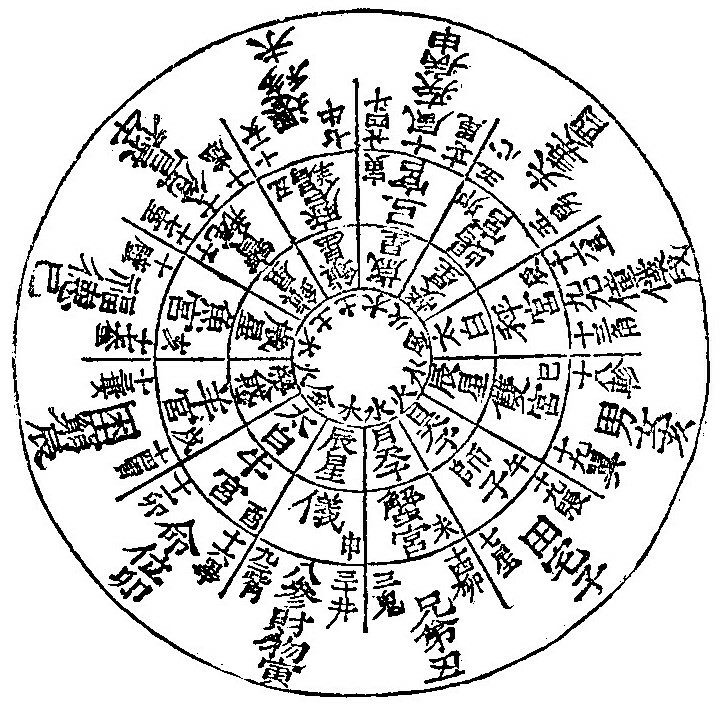 This stands in contrast to the native Chinese model, in which the planets are named after the five elements (for instance, Mars is the “Fire Star” 火星), though during the eighth and ninth centuries, as a result of influences from foreign religions, Chinese civilization also started conceiving of the planets as gods, and depicting them as such. If the planets are gods, then it is easy to understand why mystics and mages sought to negotiate their fate and fortune with these powers. This is why astral magic is found throughout the religious landscape of the pre-modern “Old World”. The Picatrix, was translated into Latin during the thirteenth century from the eleventh-century Arabic Ghāyat al-Ḥakīm, a manual of astral magic often based on Syrian sources. This rather dark work allows the mage to interact with the planetary deities through various rituals. Similarly, traditions of astral magic ended up in Japan from China, starting in the ninth century, which then evolved in unique ways. These rituals, which I have been researching over the last year or so, fuse together Daoist, Indian and Iranian elements within a loosely Buddhist framework. I should note that the goal of Buddhist astral magic in East Asia is seldom related to liberation from saṃsāra or attainment of wisdom. 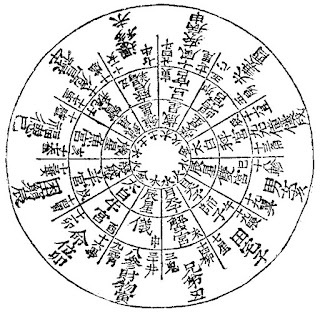 I am presently examining a Japanese horoscope for a monk born in January of 1113. The accompanying commentary, written by another Buddhist monk, indicates that the client was primarily interested in his worldly affairs, such as his economic forecast, lifespan and number of disciples (in this context, his adopted heirs). As a means of countering unfavorable prognostications, the astrologer advises his client to carry out rituals for specific planets, especially the malefic ones, which include the baneful Rāhu and Ketu. The idea here is that you can negotiate your fate with the planetary deities yourself. Within a Buddhist context this might initially seem to contradict the doctrine of karma, since your suffering is supposed to be in large part due to your own past actions, not the wrath of astral deities. 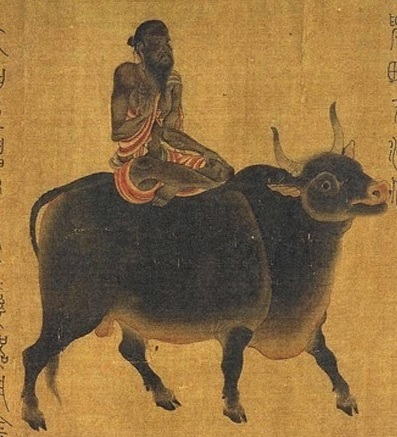 However, the more I ponder this, I realize that the existence of the navagraha within Buddhist cosmology as powerful deities is not necessarily so problematic if we consider that other deities of nature, such as Agni, are also present in the Buddhist cosmos, albeit without much significance in the literature. In another context, we might consider how Vināyaka (Gaṇeśa) is believed to remove obstacles (or create them) in the life of a practitioner. In other words, various gods have a role in the life of an individual, alongside that individual’s own karma as it manifests in innumerable ways. 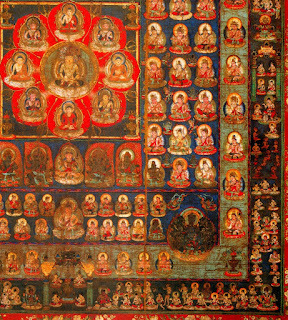 Of course, interaction with astral deities is hardly the core project of a tradition like Mahāyāna Buddhism. 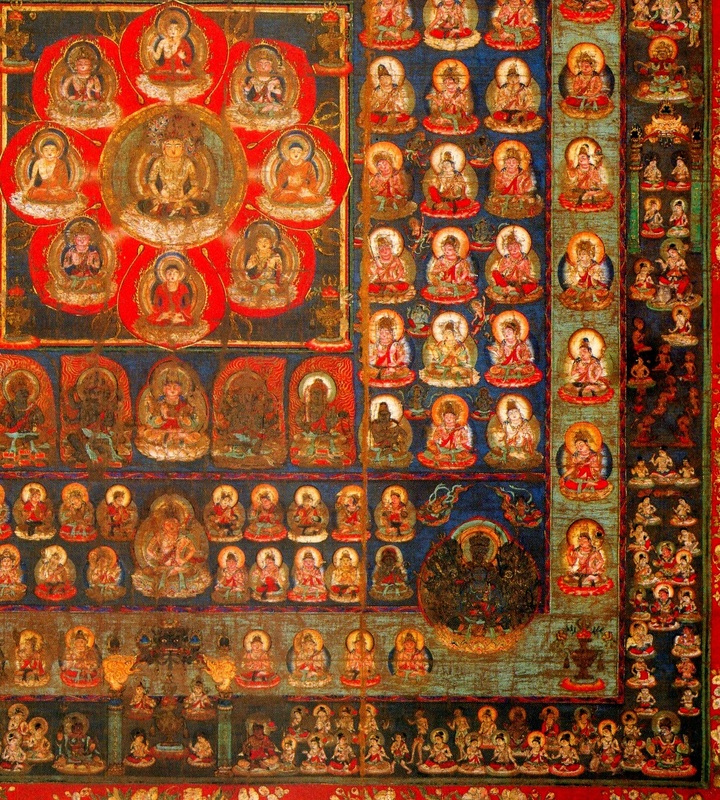 Nevertheless, such deities could be conceived of as at least belonging on the periphery of Buddhist orthodoxy. The example I might cite here is the presence of the navagraha in the outermost courts of the Japanese Genzu mandara 現圖曼荼羅 (“Presently Depicted Maṇḍala”) version of the *Garbhadhātu-maṇḍala (associated with the Vairocanābhisaṃbodhi or *Mahāvairocana-sūtra 大日經). In this position, they are symbolically farthest from Mahāvairocana and the project of anuttarā-samyak-saṃbodhi, but they still have a role to play on the fringes of Buddhist orthodoxy, if only to grant worldly blessings and ease to a practitioner of Buddhadharma. In light of the above discussion, I am very much inclined to think of astrology and astral magic as comprising a kind of “sub-religion” that has often been embedded, whether formally recognized or not, within larger religions. As my present research indicates, the horoscopy and astral magic practiced by Japanese monks were similar to what a Christian monk in medieval Europe might have done with the Picatrix in hand (of course, the Buddhist monk of course probably would not have killed any animals in their rituals). Their respective traditions are both traced back to the Near East. Buddhism and Christianity are separate religions, but on their peripheries we can see common practices. One of these is astrology, which itself has its own premises, doctrines, beliefs and gods. Astrology might require astronomical knowledge, but that by no means renders it a science by modern definition, but at the same time I have never seen anyone calling it a religion, even though it has all the features of one, including prominent patriarchs of sorts, such as Nechepso and Petosiris. I suppose the main objection would be to point to the theories of Ptolemy, who conceived of the planetary influences in a naturalistic or even materialist manner. Ptolemy, despite his later popularity, is actually unusual so far as classical astrology is concerned. The literature that I have been studying tends to suggest that the early tradition of Hellenistic astrology thought of the planets as gods with their own unique qualities and even personalities. The Greco-Egyptian tradition of magic also produced means to interact with the planetary deities. 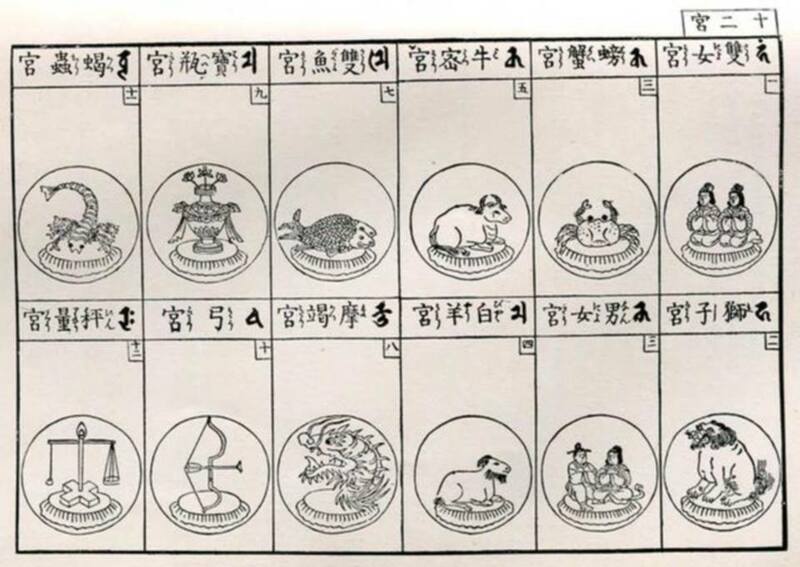 This very religious conception of astrological lore and practice is actually what we see throughout the history of astrology, especially in Asia. Astrology, in my opinion, is basically religion, and should be studied as such by scholars. I feel much could (and should) be said about alchemy, as a cursory glance at the works associated with such diverse figures as Hermes Trismegistus or Liu Huayang indicates. Calling it "premodern chemistry" seems very out of place, although we can say that many alchemists conveyed actual knowledge of chemistry, just as astrologers conveyed knowledge of astronomy. Clearly this information is not merely incidental, either, but rather reflects a worldview where scientific facts held symbolic significance to the religions in question. Yes, I think a lot could be said about the religious underpinnings of alchemy. All too often alchemy and astrology are studied by historians of science who are interested in tracing the premodern developments that led to the creation of Western science. That they're considered "proto-sciences" probably explains why they are not so widely address in Religious Studies. "...reflects a worldview where scientific facts held symbolic significance to the religions in question." Of course, before modern times, the concepts of 'religion' and 'science' did not exist, so it is unsurprising that they could assign symbolic value to what we would call scientific knowledge. I wish John Michael Greer would comment on this. To me he is the uber-polytheist. It would seem like polytheism never really goes away, it just puts on different clothing, sometimes becoming almost unrecognizable. Buddhism seems exceptional among the prophetic religions in how accommodating it was to polytheism. A lot of Buddhist areas outside of India had there own local pantheons as well as Indic deities. I suppose from a Buddhist perspective one could say that astrology and its various deities regulate samsaric existence and that actions along the noble eightfold path drag one away from the influences of fate. That's what Master Sheng-Yen said and it seems reasonable to me. Going against the stream would have actions that are unpredictable. Buddhism can accommodate "heterodox" gods as mundane deities who may be regarded as powerful, but ultimately they're unhelpful in liberation from samsara. The traditional ideas of polytheism in which some gods are the chief architects of the world and cosmos are less acceptable to Buddhadharma since it is thought that the collective karma of all beings produces the universe. That being said, Agni and other old Vedic deities are still around in the Buddhist pantheon, but they're relegated to quite unimportant positions.